Saudi Minister of Petroleum and Mineral Resources Ali al-Naimi at OPEC headquarters, Vienna, Austria, Dec. 4, 2015 (AP photo by Ronald Zak). 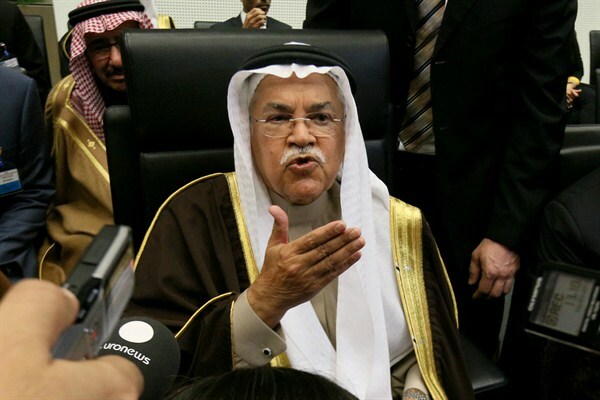 “We’re all in this together,” said Ali al-Naimi, Saudi Arabia’s veteran oil minister, at an oil conference in Houston last week. The oil market “could drown in oversupply,” as the International Energy Agency (IEA) warned in January, and global prices are at their lowest level since 2003, so all petrostates are bleeding. Venezuela is on the brink of bankruptcy; Russia’s economy is expected to shrink for the second year in a row; and Nigeria and Azerbaijan are seeking emergency loans from the World Bank and the International Monetary Fund. The economic hardship experienced by its members makes one wonder why the Organization of the Petroleum Exporting Countries (OPEC) has not cut its production to prop up oil prices, as it has done regularly during the past three decades. The answer, in short, is that the oil market has changed dramatically. The self-proclaimed cartel will have a hard time carving out a new niche for itself in this new oil age.